How to get there: Go east from Alamosa or west from Fort Garland on US 160, to the road US 150 that heads north to the Sand Dunes National Monument. Go US 150 north exactly 5.1 km, then turn right onto a small dirt road. This road heads straight towards the Blanca mountains. Drive this road as far as your vehicle/driver finds reasonable, then park somewhere off the road and start hiking. Route description: The route is most easily divided into two parts, from the trailhead to Como Lake and from Como Lake to the summit. 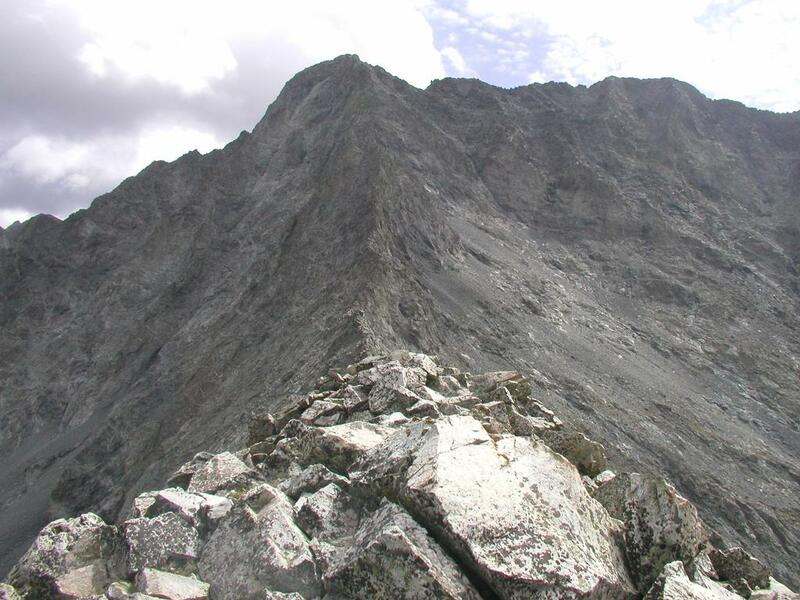 Most climbers will camp in the vicinity of Como Lake due to the long approach and, in particular, the large vertical gain from the trailhead to the summit. Jeep road: This road can be quite hot, carry enough water. There is a jeep road from the trailhead and all the way to Como Lake, this road has the reputation of being the worst in Colorado. However, the first part of this road is not at all very unreasonable, with a sturdy 4 wheel drive vehicle one can drive approximately 3 km without trouble. The first spot indicating what will come is perhaps some rocks in a left switchback part way up the hill. There are numerous places along the road where one can pull off and park. The road (from the trailhead) first climbs gently, later more agressively with hairpin turns up the hill. Eventually it contours into the valley formed by the creek from Como Lake. The jeep road continues for a while on the right hand side of the creek, but eventually crosses the creek and continues its seemingly endless climb. Finally, one arrives at Como Lake, elevation about 3600 m. It should be stressed that the final part of this road is extremely rough and should not be driven, this applies in particular to the section after crossing the creek. The rocky obstacles are called "jaws" and a memorial plaque tells the sad story of a fatal accident in August 2002. Climb from Como Lake: The jeep road continues well above Lake Como, climbing through the last trees. Just as the trail/road emerges from the trees and the slope eases, the route to Little Bear goes right, across the small creek and up the large and very distinct couloir that tops out at the ridge above. This climb is quite easy in late summer. Earlier in spring/summer, the couloir is filled with snow and then an ice axe and crampons may be needed. From the ridge there is a nice view into the next valley over. The route continues left along a fairly distinct trail somewhat below the ridge (on the right hand side of the ridge line). However, one can also continue on the very top of this ridge, this alternative is more fun and provides a very good view also into the Como Lake valley as well as across to Ellingwood Point. The ridge is wide and easy to follow until you reach a distinct, small notch. This notch is the top of a much steeper and more narrow gully that runs down to Blue Lakes area. From this point on the ridge one should contour into the slope below Little Bear Peak. There is a fairly distinct trail and it is marked with cairns. First, there is a slight descent, once below the gully the trail climbs upwards. At this point one is in the lower part of the so-called Hourglass a couloir of just that shape. There should be ABSOLUTELY NOBODY above you at this point. 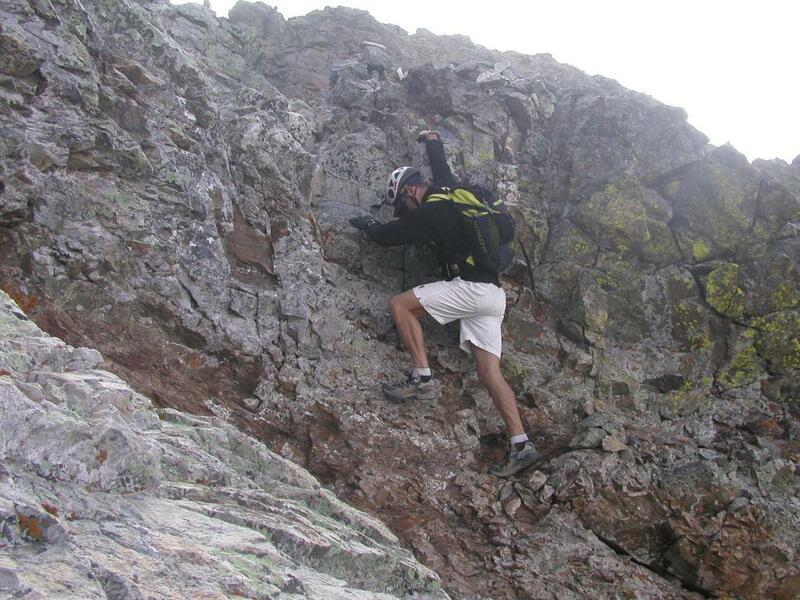 This couloir is by far the most dangerous place with respect to rocks on any fourteener. It is very difficult to avoid releasing a rock if you are higher up, and any rock that starts travelling down will almost certainly come straight through the Hourglass. Even small rocks will have a velocity that can be deadly. To make things worse, when climbing the narrow and most difficult part of the Hourglass, there is virtually no escape to get out of the way quickly. If in doubt, wait in safety. The climb up the Hourglass is not very steep, but care is needed. The best way is likely along the lowest (deepest) part of the couloir or on the right hand side. 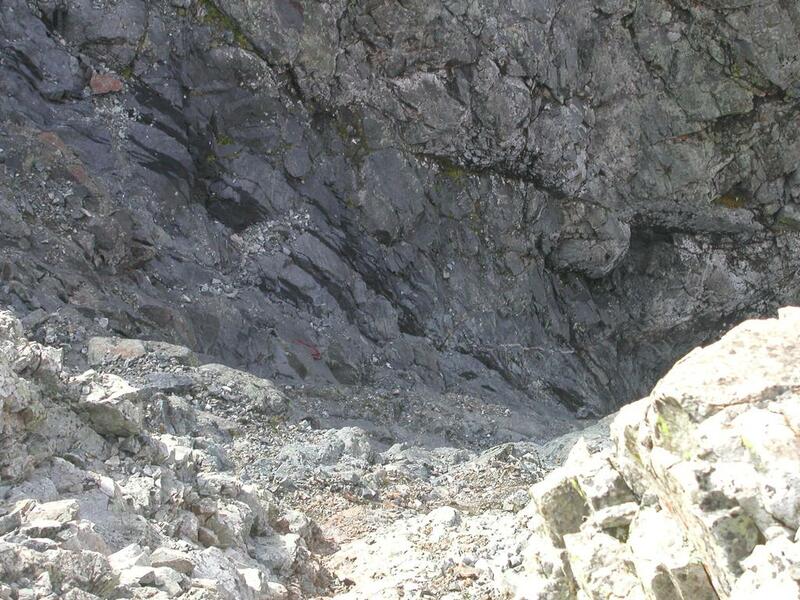 The difficult section is about 40 meter of which about 5-10 meter is clearly class 4. There is a rappel anchor at the top consisting of three pitons and slings. 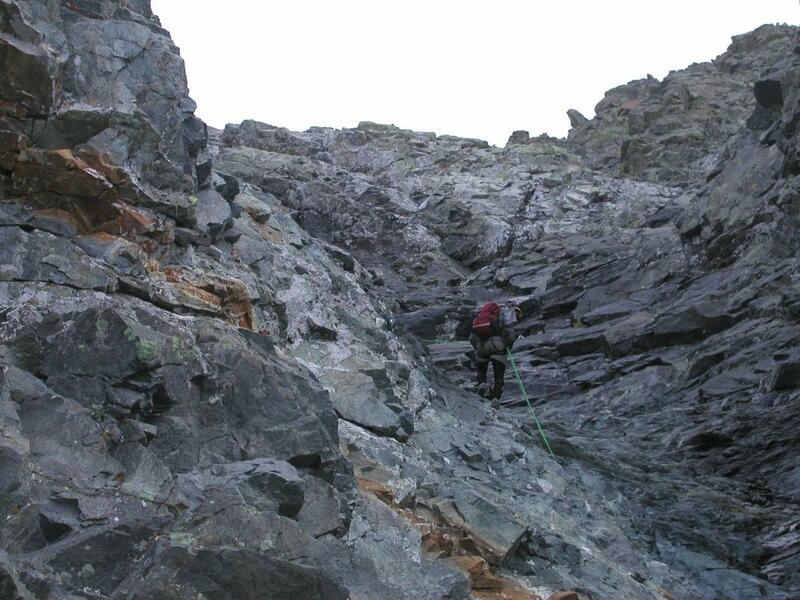 Above this point, the terrain is still steep, but there are more ledges, foot and handholds. It is perhaps easiest to continue upwards bearing to the left, nearing the ridgeline. Higher up, one should then do an ascending traverse to the right. This traverse will cross a distinct rib that runs downward and partially defines some shallow, parallel gullys. The rib requires a short, steeper climb (see picture below). When the ascending traverse has brought you to a point from which further progress directly up is easy, continue a short stretch and find yourself near the summit of Little Bear Peak. On descent, Dan freeclimbed down while Charlie and I used the rope (might as well, having carried it all the way up here) to rappel the Hourglass. In order to be useful from the rappel anchor, the rappel rope should really be about 50 meter (that is two times 50 meter of rope). Once down, while pulling down the rope we released about three rocks that came shooting down at lightning speed making giant unpredictable hops. Charlie would seek shelter right, while I would go left, however, the third rock made a clean and perfect hit at my small pack that was left on a big flat area in the middle. The pack shot out in the open air and then started down the slope below in big jumps just like the rocks. It really looked bad and my thoughts went to my digital camera and a GPS that was just below the top zipper without any protection or case. The pack came to rest about 130 meter further down and I could only sadly perceive the badly broken camera. When I finally reached and recovered the pack; MIRACLE of the DAY: the camera was unbroken and fully functional. I still cannot comprehend how that was even remotely possible. The climb took us 2 hours from the camp to the summit, we spent about 30 minutes on the summit and again about 2 hours on descent including many stops for pictures and short rests to absorb the beautiful landscape all around. Little Bear Peak, as seen from Blanca Peak. Dan climbing down across a rib in the upper part of Little Bear. The upper part of the Hourglass with a (red) rappel anchor. Charlie on rappel in the Hourglass. 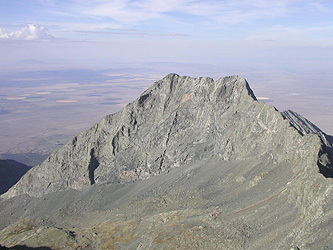 The ridge of Little Bear, the Hourglass couloir is clearly visible in the middle of the face to the right. The couloir comes directly down from the distinct "v-shaped" horizon to the right of the summit.